A few weeks ago, in a post about what income inequality means in an urban (rather than national) context, we contrasted images of a lower Manhattan neighborhood with a Dallas suburb. The Manhattan street had subsidized housing on one side and very expensive homes on the other; the Dallas suburb just had the expensive homes. Our point was that putting affordable housing in otherwise affluent neighborhoods makes for high Gini coefficients, but is also better policy than the alternative. Last week, the New York Times took a deeper look at what such a contrast actually looks like on the ground, reporting on the lives of public housing residents in Chelsea, Manhattan, one of the city’s wealthiest areas to feature large numbers of public housing units. The long article highlights both the benefits and challenges of such mixed neighborhoods. Start with the good news. The Times references a May study by the New York City Housing Authority (NYCHA) and NYU’s Furman Center that compared outcomes for public housing residents in three kinds of neighborhoods: persistently low-income, persistently high-income, and “increasing income” (or gentrifying). Residents of public housing projects in wealthy and increasing income neighborhoods showed dramatically better economic and quality-of-life outcomes than those in low-income neighborhoods—even though their racial, ethnic, and age demographics weren’t significantly different. Annual household income for public housing residents was roughly $4,500 higher in more affluent neighborhoods, and $3,000 higher for those in increasing income ones. Predictably, violent crime rates are also significantly lower. 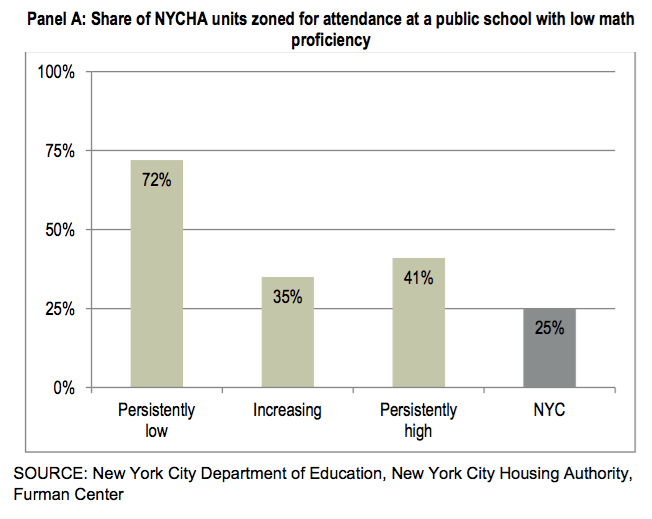 And perhaps most encouraging, children of NYCHA residents in affluent and increasing income neighborhoods not only go to schools with much better test results, but score much higher themselves on reading and math. In many ways, the study is yet another confirmation of earlier work by researchers like Raj Chetty and Patrick Sharkey, showing that being poor in a poor neighborhood is usually much worse than being poor in a middle-class or affluent neighborhood. While the juxtaposition of very high income households and very low income households in neighborhoods like Chelsea brings the problem of inequality into sharp relief, places that are home to a mix of household types neither cause income inequality, nor do they make the effects of poverty worse for the poor. If anything, these sorts of mixed-income neighborhoods actually work to reduce inequality—or at least improve mobility between income groups—compared to places that are more “comfortably” homogeneous. There are also, however, some problems. One of them has to do with a gap in the housing market. New York is fortunate to have a large stock of relatively well-maintained public housing in many of its more affluent neighborhoods—in Chelsea, a full 29 percent of all homes are in public housing or other income-restricted units—but, as some of the most in-demand real estate in the world, the homes whose prices are set by the market are almost uniformly very expensive. That leads to a neighborhood where low income people can live in public housing, and rich people can live in market-rate housing, but there aren’t necessarily many places to go if you’re middle class. But this may be one of those times when extreme cases make for bad policy. In most places, the solution to a missing middle is to build missing middle housing. Chelsea, and other Manhattan neighborhoods, however, combine some of the highest density in the country with some of the highest housing demand in the world; its affordable housing solutions are necessarily going to look very different than those of most American neighborhoods. (That is, building small apartment buildings and granny flats is unlikely to help anything in Manhattan.) While it’s unclear what to do about middle class housing in Chelsea, this problem is unlikely to be intractable in many other places. Or if it is intractable, it would be for political, rather than economic, reasons. Both of those are genuine issues, and policymakers ought to be aware of them. We at City Observatory have been particularly concerned with the latter; our “Less in Common” report focused on the decline in public amenities where people of different backgrounds can interact and build a sense of community. Making sure that mixed income neighborhoods have such public amenities—parks, swimming pools, markets, and so on—that people of all backgrounds feel welcome and attracted to is a crucial part of building successful urban communities. At this point, some readers will be thinking: Sure, this works when low-income people live in public housing, whose affordability isn’t going away. What about neighborhoods where most low-income people live in homes whose prices are set by the market, and which may price them out if more middle- and upper-income people move in? A recent study has some encouraging news on that front as well. Look for us to take it up soon.